!cid_X_MA1_1306178791@aol, originally uploaded by bucklesw1. 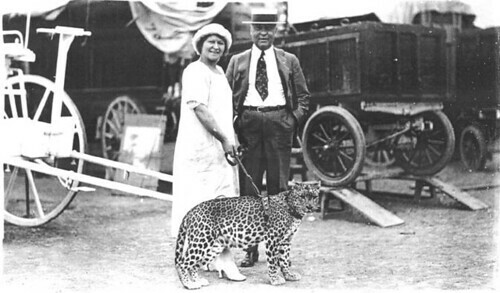 This photo (from CWM) shows Charles Ringling and Olga Celeste, the leopard lady, who presented her cats in the show. This is in the RBBB back yard ca. 1922. We do not see many photos of Charlie on the lot. Yet, he was there all the time while brother John was gallivanting all over the place. Charles was a micromanager, sort of like James A Bailey. Charlie knew every aspect of his circus down to the last detail as evidenced by the very comprehensive memo he wrote to his General Manager Fred Warrell making decisions about the upcoming 1922 season. It was published in the Jan-Feb issue of BANDWAGON. It gives us a rare insight into Big Show operations of the 1920s, about which little is actually known. Behind the two circus celebs is one of the three small shifting or transfer cages used to move the big cats and bears into the big top for the acts. One of the large performing animal cage wagons is behind it. The animals were kept in the backyard and housed in the big cage wagons except when taken into the arena. The small one is up on a portable ramp, presumably to make the animal transfer easier. RBBB was a late comer to big cage numbers. The brothers did not favor them. There was never one on the separate Ringling show. Barnum & Bailey made a single exception and featured Adgie Castillo and her lions in 1915-16. But by 1920s, big cage acts were all the rage so the Big Show followed suit and had them from 1921 through 1924. And they really went all out, with a big lineup of famous trainers, including Olga Celeste. Except for Beatty's appearances with RBBB, only at the NY and Boston indoor dates to start the seasons in the early 1930s, RBBB had no more wild animal acts until John North took over for the 1938 tour.